Having lost two young patients to skin cancer, South African, plastic surgeon, Dr. Des Fernandes, formulated Environ Skincare to promote skin health. Having spent many years researching which ingredients were needed to feed our cells, he devised a step-up system of homecare that truly delivers exceptional results. We like to think of Environ treatments as an infusion for your skin, like fruit and veg for your skin AKA face food! However, whatʼs so different about these treatments are the methods used to push ingredients deeper into the skin. Dr. Des uses both Sonophoresis and Iontophoresis to increase penetration of active ingredients like anti-oxidants and peptides into the living layers of our skin. 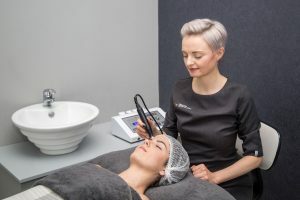 Iontophoresis increases penetration by 400% while Sonophoresis increases penetration by 4000%, making an Environ Facial the equivalent of 77 hands-on facials. Each treatment is customised to suit both our clients skincare needs and also as you, our client, progress in your homecare, we too progress in your in-clinic treatments. This ensures constant advancements in skin health. Even after one treatment, results are noticeable. During, your Skin Fitness Assessment, we will advise on which treatments we feel are necessary to achieve your desired results. Find out more about our Skin Fitness Assessment here.